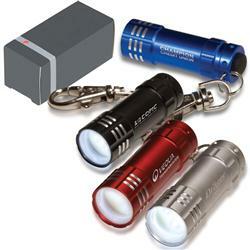 The Micro Torch custom mini aluminum LED keylight and flashlight with latching key holder. Three ultra-bright LED bulbs. Rubber push button on/off switch on end. FREE RUSH AVAILABLE! 2 inches long by 1/2 inch wide. Available Colors: Blue, Red, Black, Silver. Production Times Available: Free 1-Day Rush Available. Same Day Service - add 25% to price. Standard 10 Day Production with Paper Proof. 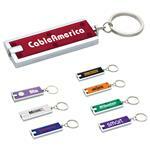 Dimensions: Size : 2" long with 1/2" dia. 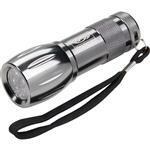 3 LED light keylight aluminum. Shipping info: 600 pieces per carton, 30.00 lbs per carton, carton size 8.00" x 16.00" x 12.00"